Armenia travel highlights including Garni, Gerhard, Khor Virap, Echmiadzin, Tatev, Lake Sevan and Dilijan. Read more about Armenia's sights and churches. 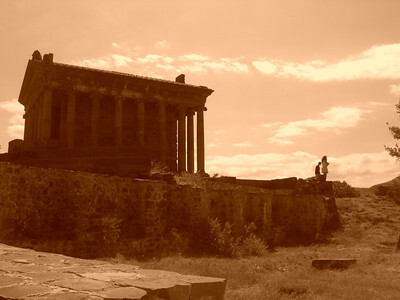 Garni temple, outside of Yerevan, sits atop Avan Gorge. Read more about Armenia's sights and churches. A couple of tourists look out into the valley surrounding the temple at Garni (outside Yerevan). The temple has been rebuilt several times after wars and earthquakes, the latest time being in the 20th century. 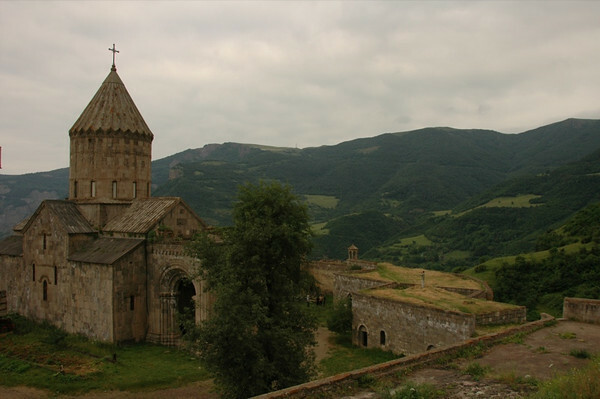 Read more about Armenia's sights and churches. Khor Virap church perched underneath Mt. Ararat outside of Yerevan. Read more about Armenia's sights and churches. 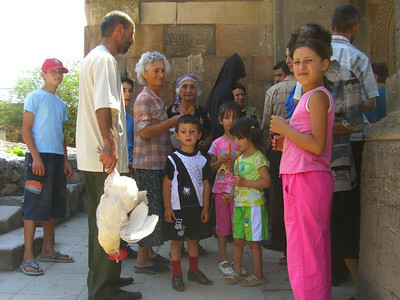 This family waits for a blessing from the priest at Khor Virap church. The chicken was brought as an offering to give thanks for something good. Read more about Armenia's sights and churches. 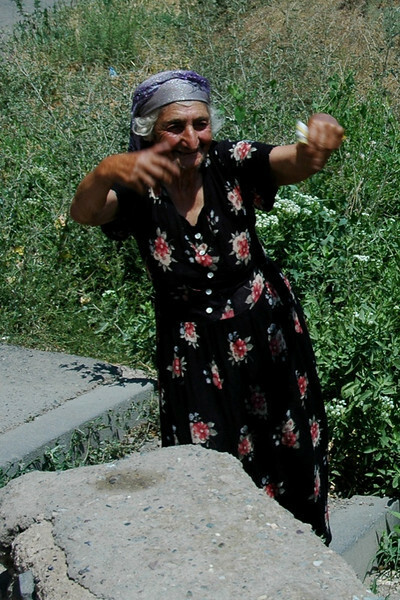 This woman started grooving to some music playing at Khor Virap church. Her family had brought a chicken to the church for a blessing before they sacrificed it to give thanks. They invited us to share the chicken with them. Read more about Armenia's sights and churches. 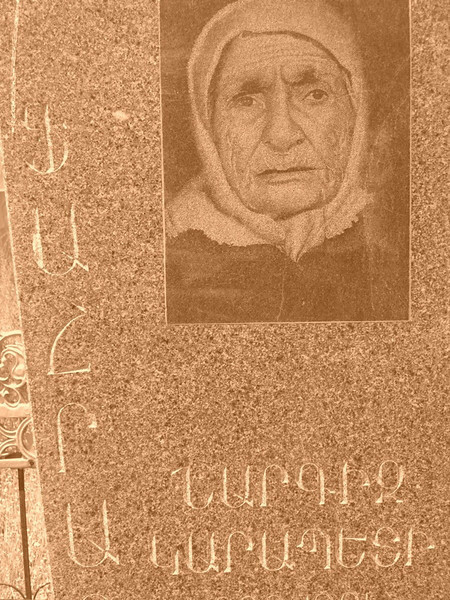 A grandma's image is engraved onto a grave near Khor Virap church. Armenian cemeteries are full of such lifelike engravings. Read more about Armenia's sights and churches. 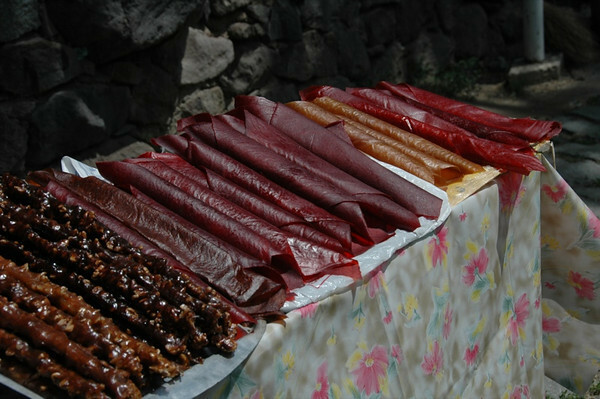 Dried fruit and nut snacks on offer near Gerhard monastery outside of Yerevan. Imagine a fruit roll-up without all the sugar. Read more about Armenia's sights and churches. Located outside of Yerevan, Gerhard Monastery is believed to have been a monastery since the 4th century when early Christians lived in the caves and developed cave churches. The church pictured, Surp Astvatsatsin, dates from the early 13th century. 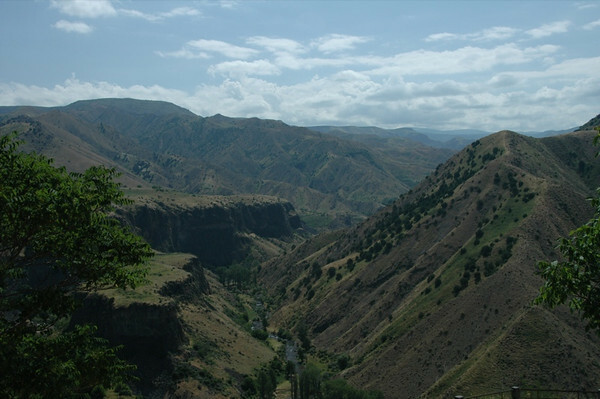 Read more about Armenia's sights and churches. 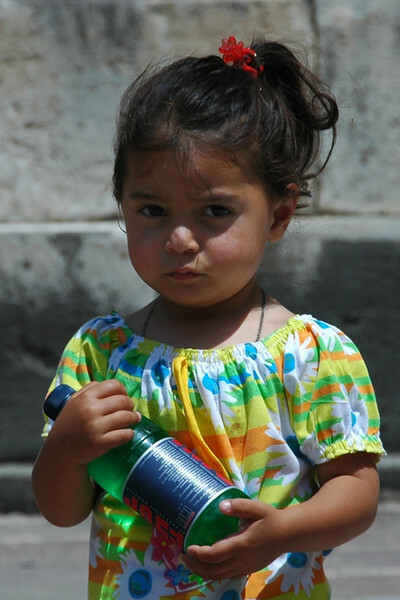 A little girl clutches her water bottle outside of Gerhard monastery near Yerevan. Read more about Armenia's sights and churches. Located outside of Yerevan, Geghard Monastery is believed to have been a monastery since the 4th century when early Christians lived in the caves and developed cave churches. 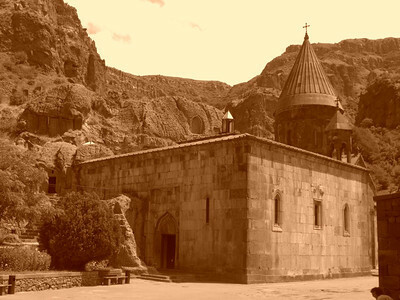 The church pictured, Surp Astvatsatsin, dates from the early 13th century. 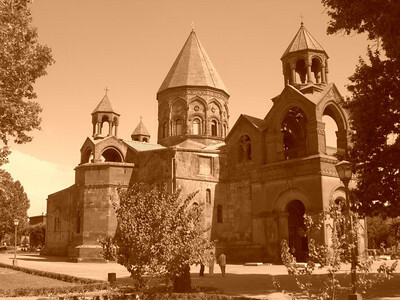 Read more about Armenia's sights and churches. 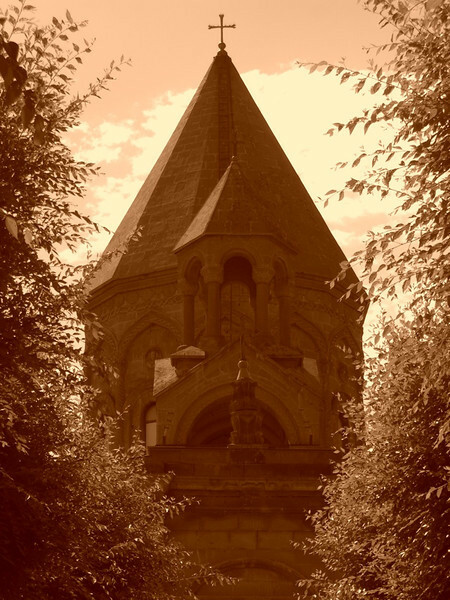 Echmiadzin, outside of Yerevan, is the seat of the Patriarch (Catholicos) of the Armenian church. Many Armenians call it their Vatican. All Armenian churches in the world use holy oil that originated from this church. ..The church has an impressive treasury where the remains of apostles and saints are held in silver arm-shaped reliquaries (looks a bit like armor). It also holds remains of Noah's ark (supposedly) and the Holy Cross. Read more about Armenia's sights and churches. Known as the Mother Church of Armenia, Mayr Tacher in Echmiadzin is the Armenian version of St. Paul's Cathedral in the Vatican for Catholics. 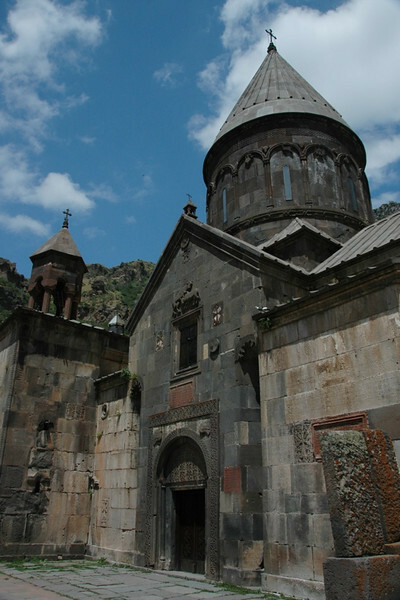 Read more about Armenia's sights and churches. 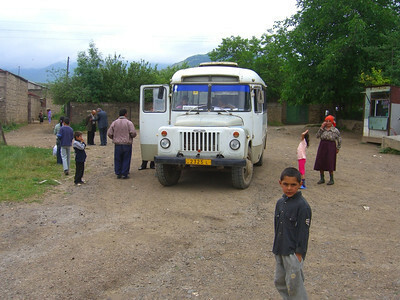 A shot of the bus we took from Goris to Tatev that managed hair pin turns and steep ascents, all the while seating three to a small bench. It was a wonder we made it...and then we took the same bus down the next morning balanced on metal milk jugs. Sore bottoms. Read more aboutour visit to Tatev and Armenia's sights and churches. Surp Poghos-Petros (St. Peter and Paul) church from the 9th century dominates the Tatev skyline and makes for a dramatic setting built on the edge of the Vorotan Canyon...Tatev Monastery was our favorite monastery in Armenia. Its location on the cliff and canyon-side was impressive. We could wander its unattended and under-touristed grounds and explore its engravings and crevices to our hearts' content. 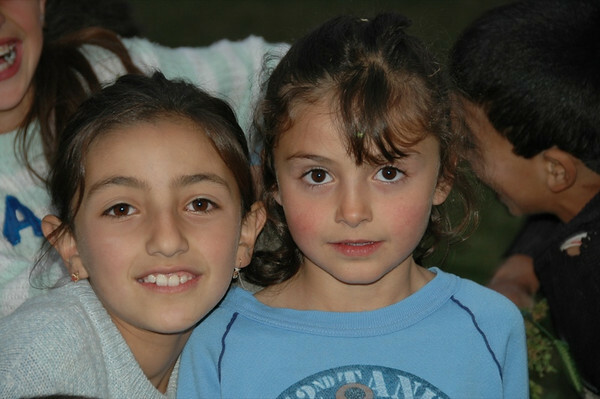 Read more aboutour visit to Tatev and Armenia's sights and churches. Brown eyes and a shyness warm enough to melt the ice caps. Read more aboutour visit to Tatev and Armenia's sights and churches. 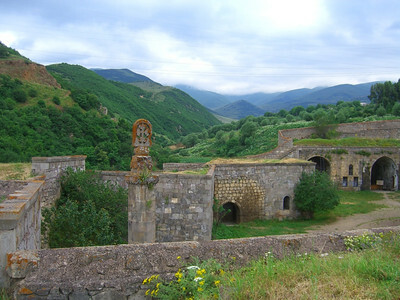 The grounds of Tatev monastery set against the hills of southern Armenia. Read more aboutour visit to Tatev and Armenia's sights and churches. 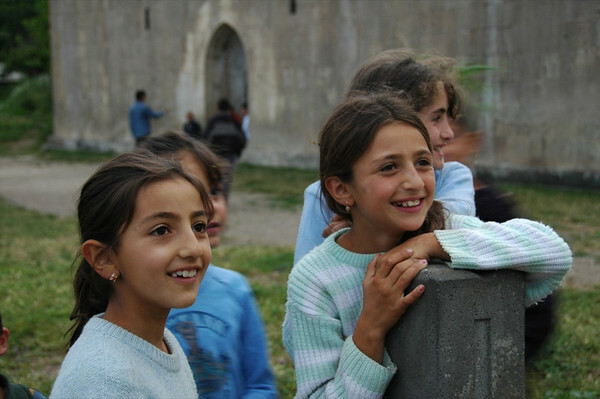 As we approached the village church in Tatev, we were besieged by excited children eager to greet us. These two girls were especially curious and seemed to capture the spirit of the moment. Read more aboutour visit to Tatev and Armenia's sights and churches. 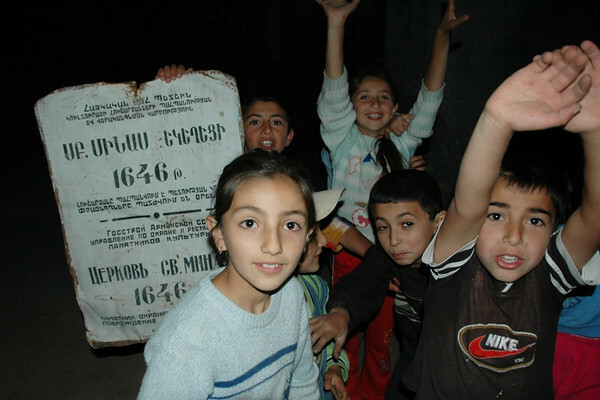 While giving us a tour of Tatev church in the dark, these kids made sure we saw the sign indicating the date of the church's construction. Read more aboutour visit to Tatev and Armenia's sights and churches. 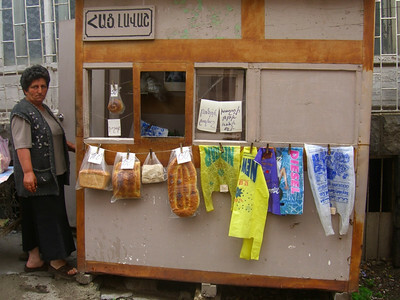 A representative shot of the main market in Goris, Armenia. Read more aboutour visit to Tatev and Armenia's sights and churches. 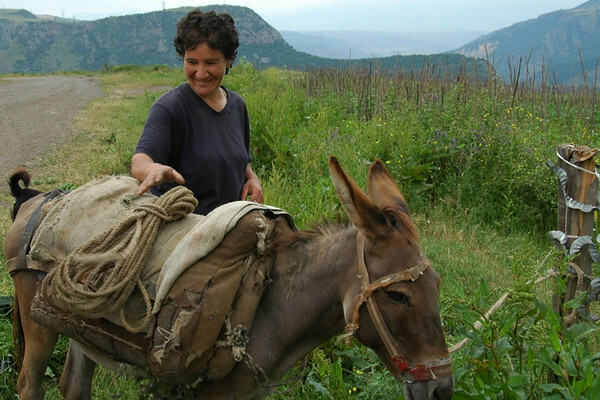 Ruzanna was collecting greens for her donkey's dinner when we encountered them on our way to Tatev monastery. 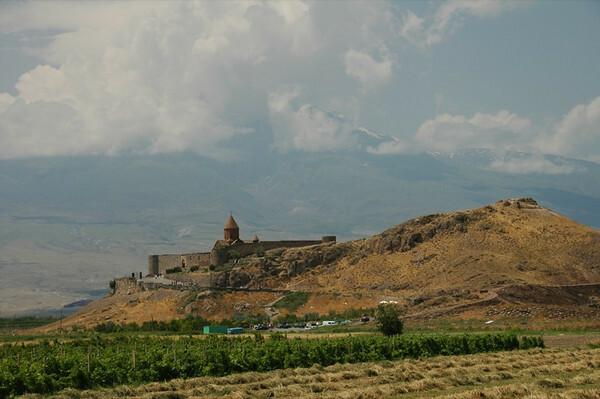 Read more about our visit to Tatev and Armenia's sights and churches.